For your heavier hauls, you are going to want to get your hands on some brakes that are up to the task. Installing new brake pads is the first step to getting brakes that are strong enough to stop your payloads. For this reason, we went and found you the best brake pads for towing out on the market. In order to make it onto this list, the brake pads had to have several important characteristics. First and foremost, the stopping power that the pads provide is essential. Obviously, if the pads don’t get you stopped when you need it, then nothing else matters. So, rest assured, every product on this list will have great bite. Second, we want to make sure that the fade on the brake pads is minimal so that you get stopped even with a heavy payload down a long hill. Lastly, durability plays a role here, as we want to fall in love with pads that last. So, check out our list for some braking options that are heavy duty enough to get you stopped fast, even while towing. 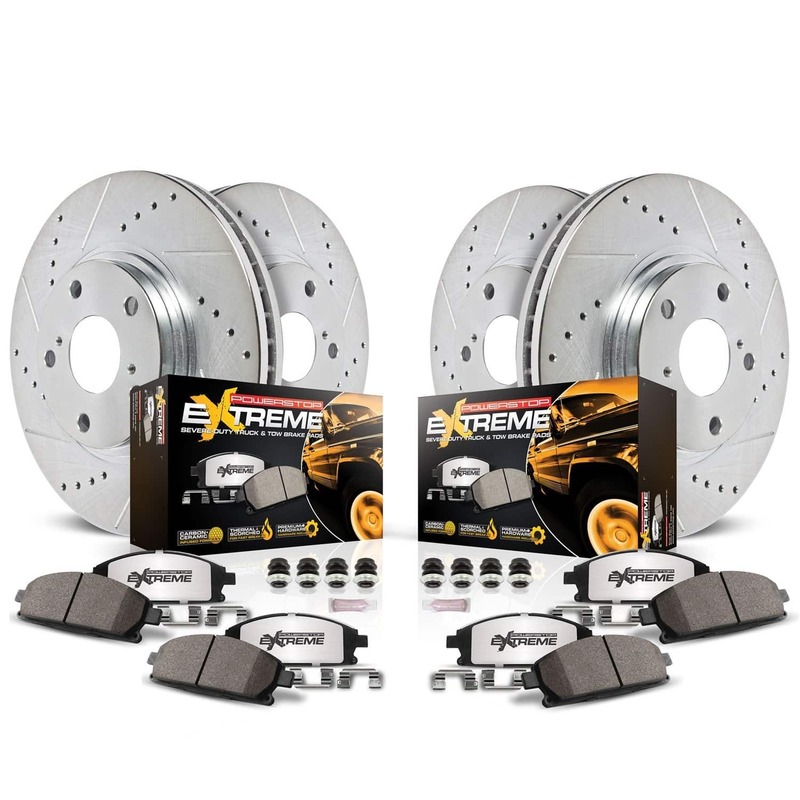 Power Stop Extreme Performance began producing brakes in California in 1995, bringing heavy duty brakes to customers for the toughest braking available. They are committed to safe and effective braking at an affordable price. Power Stop introduced themselves to the online market with their first, innovative product, the 1-Click Brake Kit, in 2011, and continue to sell brakes in full kits today. Offering a complete line of brake kits with performance brake rotors, disc brake pads, brake hardware, brake sensors, and calipers, Power Stop revolutionized the performance brakes market by taking the guesswork out of selecting the right pad and rotor combination. For this reason, Power Stop is a trustworthy company with an eye for providing quality products. For the best brake pads for towing on the market, you are looking for Power Stop’s Z36 Extreme Truck & Tow pads. These pads are specifically engineered for towing with more brake torque by utilizing carbon fiber infused ceramic material. This substance provides powerful pad bite for outstanding performance that is the best in the business. Simply put: You will very quickly come to a stop when you need to, even downhill while towing. The pads also have the benefit of being chamfered and slotted. This feature, along with the noise insulating shims, prevents the brakes from getting noisy. The slots also serve an important purpose in adding higher performance and durability by allowing debris to get away from the pads, letting the pads operate cleanly at all times. They are thermal scorched for fast break in, too. Furthermore, the backing of the plate is powder coated, making it resistant to rust and corrosion. This will ensure that you avoid rust and get to use these brake pads for as long as you can. These Power Stop pads were clearly created with an eye for detail, looking at all of the fine engineering put into this product. This combination of performance and durability is next to impossible to beat, making them the best brake pads for towing that you can find. Reviewers of these Power Stop brake pads outright love them. Those who installed these pads on their trucks noticed an immediate difference in their braking. A common mention among reviews is the sustained bite that these pads supply, even in the toughest conditions. Those who went through the proper break-in procedure saw a tremendous difference in their braking power. Customers also note how quiet and clean these brake pads are. It appears the technologies employed to keep these pads quiet are truly functional. Additionally, consumers report zero brake dust coming from these pads. A drawback, though, that some reported is that these pads may not last an outstandingly long time compared to other options on the market. However, these reports seem to be few and far between. For all of these reasons, the Power Stop Z36 Extreme Truck & Tow Brake Pads are the best brake pads for towing available today. Hawk Performance is a high quality American brake manufacturer. Their parts are designed specifically to grant users the ability to own the environment around them by giving them a way to stop when they need to. You can only go as fast as you can slow down, right? Hawk Performance claims an advantage over their competitors due to their experience in aerospace, industrial, military, automotive, and motorsports. In the last ten years, Hawk Performance braking products have won the most motorsports championships than any other manufacturer, making them a proven leader in the field. This, says Hawk Performance, gives them the edge in braking, making them the best option for your needs. 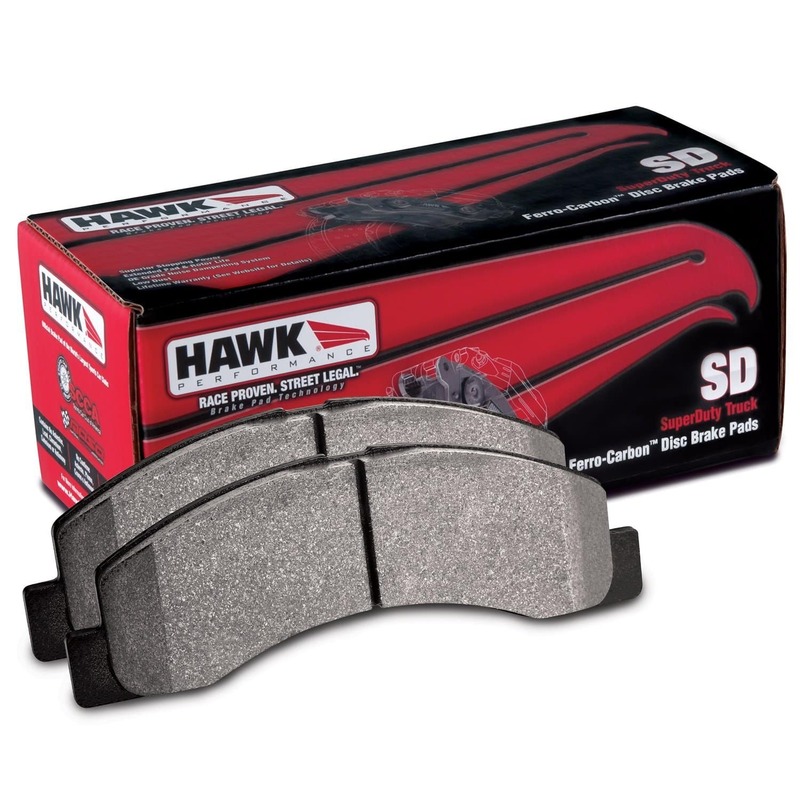 These severe duty performance brakes from Hawk Performance are some of the best available. Rated for professional fleets and light trucks with excessive payloads, these front brake pads provide serious braking power when you need it. They feature a high coefficient of friction provided by a ferro-carbon material that give the brakes serious stoppage muscle. This material in the pads also give the brakes extremely high fade resistance so you don’t have to worry during prolonged bouts of braking. Furthermore, these pads continue to operate at maximum stopping power even when they get hot. This ability is brought by the slotted design of the pads. This slot also lets any debris created by pads discharge, allowing the brakes to continue working at their maximum efficiency. All told, these brakes are sure to provide the strength you need to slow down your payload. Looking at reviews for this product, customers absolutely corroborate what the company advertises about these brake pads. Reviewers state that the bite on these pads is exactly what they were looking for. The brakes will get you stopped with no fade and at hotter temperatures, even with a bigger payload. Remarks about durability are abound in reviews on this product, stating that the brakes lasted plenty long enough compared to competitors. A certain downside that was noted by some consumers was that they found that their brakes would squeak some, especially when slowing to a stop. But, altogether, these brakes are an outstanding option for your braking needs and certainly deserve to be considered one of the best brake pads for towing. Our third entry on our list again comes from Hawk Performance. These brakes offer the same great brand name but at a step down from the enhanced product. This version of Hawk’s brakes is a bit less expensive and – well, a wise man once said you get what you pay for. While these brakes are by no stretch of the imagination worthless, they are a certainly a grade down from their bigger brother in the HB552P.722 product. These brakes still benefit from the knowledge at Hawk Performance and are engineered using technology from fleet and military applications. These brakes are made for light trucks and SUVs, as well as moderate towing. They are built for outstanding braking power with superior fade resistance that you are sure to enjoy. You’ll be able to get yourself stopped over a sustained amount of time, even downhill. The ferro-carbon material used in these brakes deliver this ability, giving them an advantage over standard OE pads. They also benefit from the slotted design that allows the pads to operate at their maximum for as long as possible. These pads are very low dust, something that the cleaner towers among us will enjoy. They have outstanding pad and rotor life and are virtually noise free. These brakes are perfect given the opportunity to shine under the right circumstances. Reviews of this product are extremely high, earning it its place on our list for the best brake pads for towing. People say that these brakes got exactly what they needed done and for a great price. Apparently, these Hawk brakes are great for city driving, some quick stops, and, best of all, towing. Now, this is not to say that towing everything with these brakes is a great idea. But they are certainly great for a light or moderate tow. Also, users love the durability that these brake bring to the table. Nearly every review you can find cites the long lasting ability that these brakes have. Overall, these brakes are a great option for you and your average towing needs. Wagner is a storied company with a long history that dates all the way back to 1891, with innovation in brakes starting as early as 1946. Today, Wagner is a brake company, first and foremost, that sells quality brake products with a smaller division of lighting. With this past of success, you can bet that Wagner is selling products that you want to get your hands on. Most recently, Wagner came out with its “next generation” of brakes that stop SUVs, CUVs, and pickups up to 50 feet sooner. Buying from a brand like this is a sure bet in making an investment that you can count on. Wagner’s Sever Duty series is engineered specifically for the extreme needs in braking technology. These brakes are dependable, durable, and great for both fleet and municipal vehicles. In tests, this particular series of Wagner brakes outperformed the standards set out for them by huge margins in many cases. The SX756s are formulated for extreme heat, meaning that, even during prolonged stretches of braking downhill, you won’t be seeing any loss of braking power. These pads have long lasting strength that is sure to impress you every time you stomp on the brake pedal. Reviews of this Wagner product are exceptionally high, sporting a 4.8 out of 5 star rating on Amazon.com. Customers point out that these brakes, in short, flat out work as they are supposed to. Reports abound of these brakes having incredible durability, lasting lengthy amounts of time despite such a low price point. Nearly every reviewer makes the comment that these brakes have tons of bite and fit their rig perfectly. Allowing for the right amount of patience needed for the break in process, customer reviews make it clear that this is one of the best brake pads for towing that you can find. Wagner’s quality very plainly shines through with not only this product, but this entire brake series. Motorcraft is a parts brand owned by Ford. Ford launched this division in 1972 to replace Autolite as Ford’s official parts brand. Today, Motorcraft is making parts to fit Lincoln, Mercury, and Ford vehicles, although some of these parts fit vehicles of other makes. Just about whatever you would want to find for replacement on your car can be found on Motorcraft’s site. All of Motorcraft’s parts are built with quality and reliability in mind, including a warranty that backs up every part that they sell. For this reason, you can bet on Motorcraft’s parts to perform beautifully for a great amount of time. The durability included with the Motorcraft BRSD756, along with many other characteristics, makes it one of the best brake pads for towing. These pads are designed specifically for high-heat and high-wear conditions like trailer towing. They are commercially used for fleet delivery vehicles, taxis, and shuttles, so you know they are a safe bet for great operation on your own vehicle. These brakes are designed for minimal fading, making them an excellent option for towing on hilly terrain. 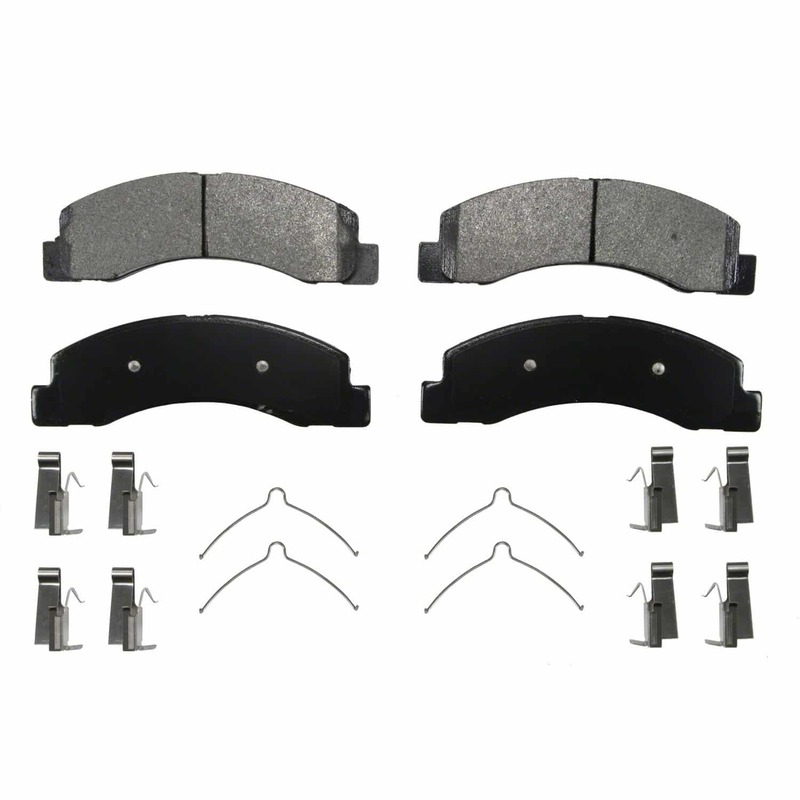 The backing plate of these brakes are designed for a super strong bond between the pad and backing plate and a multi-layer, sound-quelling shim design prevents the brakes from getting squeaky. To add to this noiseless ability, the chamfers on this product are also built to diminish the possibility of noise during periods of break-in and severe braking. Additionally, these pads are engineered with a slot in them to improve performance for both hot and wet conditions, respectively. This slot gives the gases, debris, and other brakeage reducing material a way to escape from between the pads and rotors. Those who gave reviews of this product almost unanimously rated these brakes as highly as possible. Customer reviews of this product note how happy they are with the effectiveness of the engineering that was put into this product. They say that these breaks are quiet, clean, and – most importantly – brake well. In all situations, it appears that these Motorcraft brakes supply excellent performance, living up to their “severe duty” label. For some of the best brake pads for towing, Motorcraft definitely deserves to be a strong competitor. EBC Brakes is a British brand that is well respected in the automotive market. Their products are made both in the UK and the USA, although the majority of brake discs and rotors are made in the UK. They create brakes for all sorts of vehicles, including but not limited to motorcycles, mountain bikes, ATVs, cars, and, – our favorite – trucks. EBC takes their engineering and innovation very seriously, leading them to create some of the best brakes on the market. Therefore, they probably make some of the best brake pads for towing, too. These EBC brakes are some of the highest quality and highest performing. They contain man-made Aramid fibers that are, according to EBC, second to none for braking purposes. 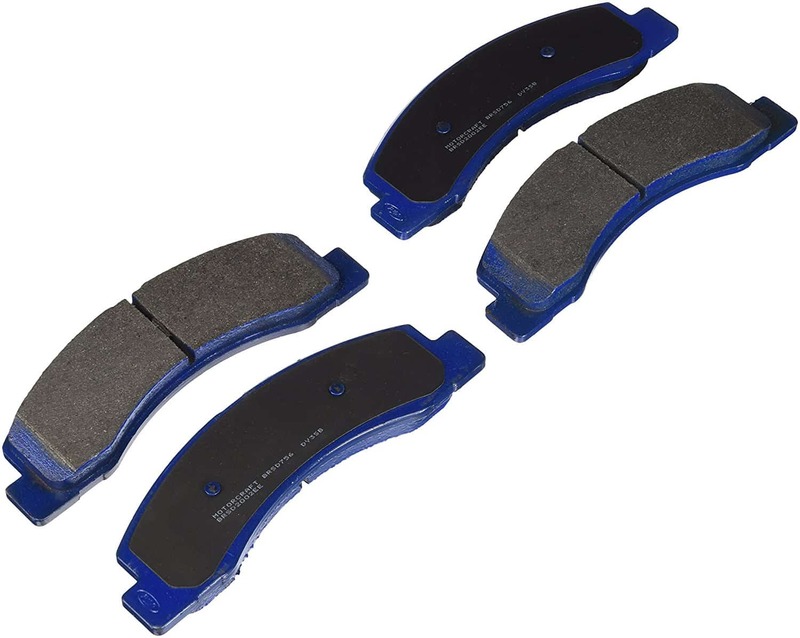 These severe duty brake pads are lightweight and high strength with abrasion resistance and thermal stability. Because of this, you can expect quality performance out of these brakes in the areas of fading as well as temperature consistency. These brakes will get you stopped as soon as you need with a heavy tow, downhill, and on a hot day. Also, this Aramid material is noiseless, meaning none of that annoying squealing that you might get out of lesser brake pads. They even contain the grooves in the pads, similar to other brands, which allow heat and debris to escape the pads for more consistent braking. Altogether, the engineering of these brakes was clearly very detailed and concise, making them one of the best brake pads for towing. Unfortunately, reviews for this product are not as plentiful as other brake types. This series of pads was only recently made available in the US so this product is relatively new, making reviews scant. But, after some digging, we managed to find a few for you. According to these sparse reviews, these brakes work perfectly as advertised. They are noiseless with plenty of bite. However, none of these reviews were able to speak for the durability of this product so this is a bit of a question mark for this particular brand. While this may be a bit of a concern for you, the durability of EBC brake products generally is high. Whether this quells your durability concerns or not, one thing is for certain: These EBC brakes are in the upper echelon of brakes pads for towing and should make it onto any shortlist of top brakes for the purpose.